After how they left off at the end of Episode 3, I figured Bigby would be in rough shape and we’d have to kind of gumshoe our way through the investigation some more into the big bad pulling Bloody Mary’s strings and who was after Ichabod, or at the very least working with him. That’s pretty much what we got with this one, but it feels short; not rushed mind you, but it feels like they picked up momentum and are barreling towards the final episode and have left some of the smaller touches behind. Don’t get me wrong, it’s a good pacing, but I think a few players might feel it’s being rushed, as there’s less investigation and Bigby’s piecing things together pretty quickly at this point. But I’m getting a head of myself. Let’s break this down a little. 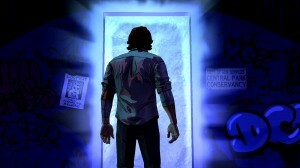 When we last saw Bigby in Episode 3 he was in a bad way. Sure, he’d gotten the best of the Tweedle’s, but he’d been shot a number of times and had his arm snapped open, and Snow had allowed Bloody Mary to take Ichabod, who we’d been after all of Episode 3 for his connection to the murders, in order to spare Bigby’s life. I’d say that’s a fair trade. Not all the Fables in New York City agree, however. 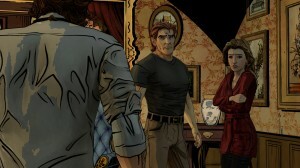 The doc comes over to stitch Bigby up again, worried the silver bullets might cause a reaction in Bigby. This leaves Bigby to reset the broken bone in his arm, which is as painful to play through and watch as it sounds. Snow has decided to take charge in a bigger way and starts with laying down the law on Fables who aren’t using glamours to disguise themselves and demanding Bigby start playing by the rules a bit more. That’s entirely up to the player at that point. It turns out there’s another lead; Nerissa, the dancer from the Pudding & Pie that got you a lead before, wants to talk to Bigby. Nerissa lets you in on as much as she can, but she’s be-spelled. She can’t say much of anything at all except to drop vague hints, and if you play it right, you can figure out what exactly is keeping her from talking and how the other two girls lost their heads, and that it all leads back to whoever is giving orders to Bloody Mary. From there, she points you in the direction of Belle and the Beast on her way out when Snow interrupts the interview. Bigby has options, but I chose to talk to the pair to get more information, and that leads you to either a Pawn shop or a Butcher. I don’t know if you lose anything by going to one over the other, but I think things may change a bit depending on how over the top you are with Bigby at each place. 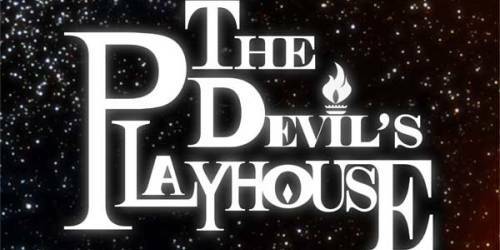 I was highly amused with the introduction of Jersey as my wife’s from there, so I’ve heard all the stories of the Jersey Devil way back when we first got together. Jersey doesn’t disappoint. The pieces fall into place though, and give you a good lead as to who’s behind it all and a way to get to them, but you didn’t think it’d all wrap up nice and neat before Episode 5 did you? Visually, this episode doesn’t pop as much as some of the others. They still use a lot of color, but it’s more subdued this time around, which still works for the episode. 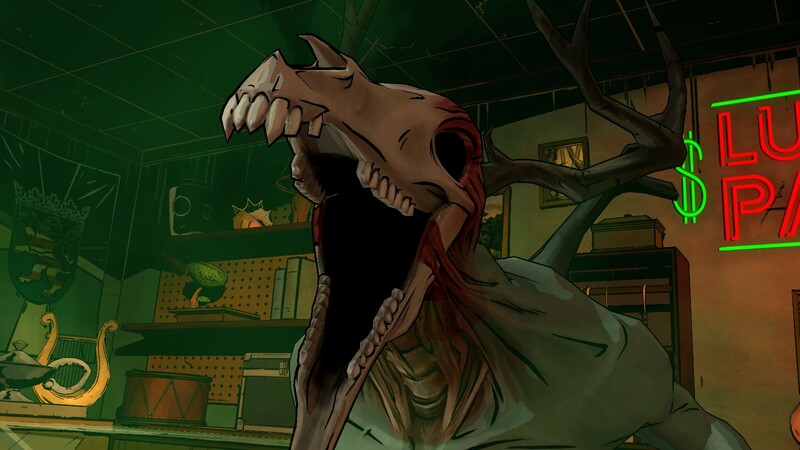 I think one of the better uses is in the Butcher shop, as Bigby is wading through the hanging meat in the back room trying to get through and you can’t really see what’s ahead. 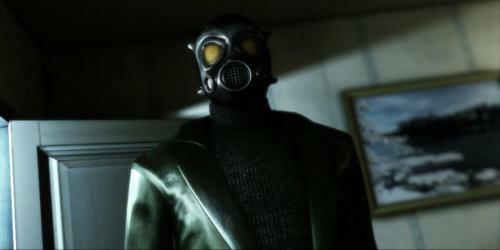 It’s a great effect and really adds to the tension of the scene. The voice actors do a great job again, and I have to give kudos to Dave Fennoy for his portrayal of Bluebeard in this series, who is a complete reversal from Lee in the Walking Dead. It’s great hearing familiar voices, but even better that they’re giving them a diverse cast of characters to play that aren’t the same character all over again. Control and gameplay wise you’re not looking at anything new here if you’ve played any of the other episodes. The combat works the same way it always has, as well as the investigation portions of the episode. If you’d like a more in-depth look check out my review for the first episode here. Like the previous episodes, there is at least a second run through of the episode if you’re trying to unlock all the Book of Fables entries or if you’re trying to get all the achievements, though the two are kind of tied together, really. 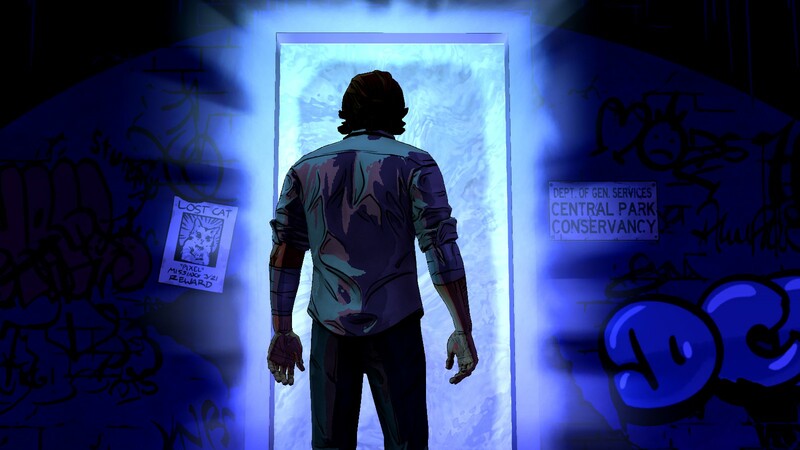 There are a few choices that could pan out into something with that last episode coming up, especially with how Snow and Bigby interact as well as a few of the other Fables. I’m not entirely sure it’ll be a lot, but it’s always interesting to see how your choices throughout stacked up with everyone else’s. I don’t think this one was any harder than any of the other episodes, other than trying to figure out how to get a few people to talk without trying to break them in half, just for variety’s sake. I am a little worried that this felt shorter. Things are moving at a brisk pace, and although it seemed to run about the same length when I looked at my actual time, this episode ends more abruptly than the others. It has the added effect of wanting that last episode sooner and leaving you annoyed you don’t get to continue on right then. I hate cliffhangers. This is still a pretty good deal. For ten hours of play, roughly, unless you play through each episode twice to unlock it all and then never revisit it again, you’re only paying less than half the cost of that big budget action title for about the same amount of content. 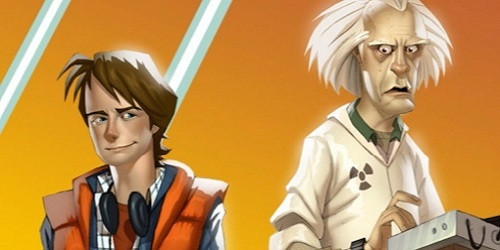 The Telltale episodic series’ have been and continue to be one of the better deals in the current gaming environment, and I hope they can keep it up. At this point, while there are some definite surprises with what’s going on, you’re not going to see something completely unexpected. By that I mean, if you’ve been playing the other episodes, then you know going into this one what kind of content you’re going to get. As far as using the Fables setting to tell their own story they’re doing a great job, but you know how it’ll play, how combat will work and the only new surprises are going to be what they put in front of you story-wise. Once you get over the initial shock value at the front end of the episode, there’s a very normal, well for the Fables anyway, story about corruption and to what lengths someone will go to control it. I do have to say this was really addictive and well done. I was annoyed when I kept getting interrupted for things outside the game and had to pause a number of times. That all goes back to the pacing I was talking about earlier. Even when you’re poking around looking for clues this episode moves right along and keeps you hooked. 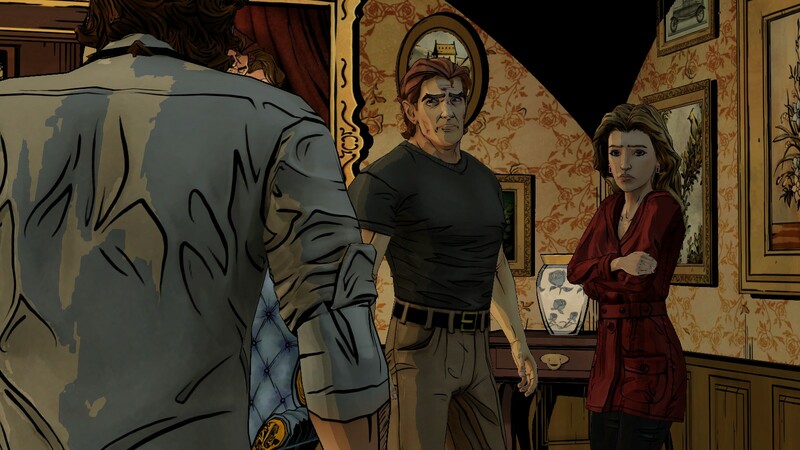 Telltale have done a great job with a number of their licensed properties, and Walking Dead and Wolf Among Us has been some of their best work. This has lots of appeal for a wide variety of players and groups of people and is involved enough to keep most gamers happy but is accessible enough that pretty much anyone can jump in without too much trouble. That’s been true of earlier episodes and continues to be true with this one. Between some decent story-telling, a great price, and a load of well-fleshed out characters and game worlds, there’s a lot of reasons to get into this game. So what problems did I have? Well other than getting distracted a number of times by things not in the game and missing a few dialogue cues, I didn’t have any issues. The game loaded smoothly, played well, and most importantly, no visual or audio hiccups. No, the only annoyances I really had were from Steam and trying to nab screenshots while I played for this review. 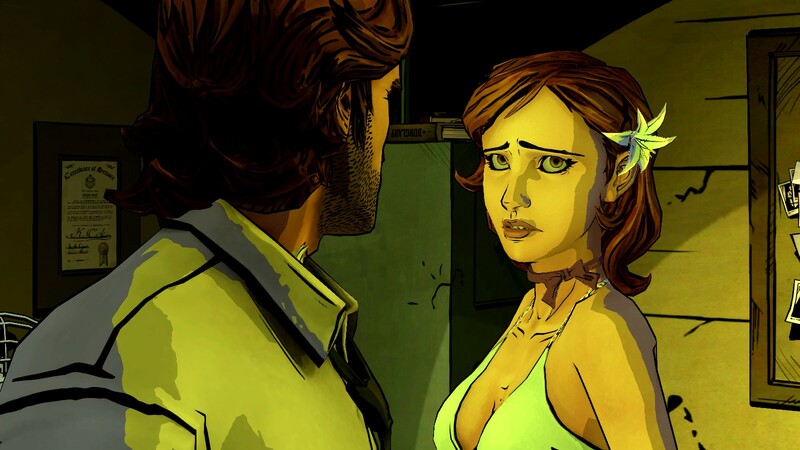 The Wolf Among Us as a whole has been a fairly solid series at release and some of the issues on PC that I was having before in other Telltale releases are pretty much non-existent in any of their newer releases at all. 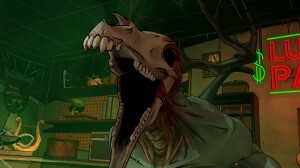 It’s much more fun to be involved with anything when it’s working right and even with the hiccups Telltale has been putting out some quality story-telling. The Wolf Among Us continues to be a great series and I can’t wait to see what they end up tossing our way for the finale with Bigby. 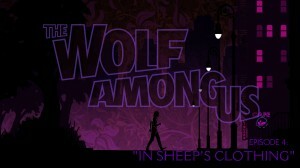 The penultimate episode of The Wolf Among Us leaves us on a pretty big cliffhanger, answers a few questions, raises a lot more and leaves you looking to crack some heads and put this whole murder mystery to bed once and for all, but in a good way. The episode moved at such a brisk pace that it ended up feeling much shorter than the others while still running about roughly the same time. Not a bad thing, but it’ll leave you wondering where your time went. The opening sequence of this episode alone with Bigby trying to fix his arm had me squirming and looking to get a little payback and it was so worth it. 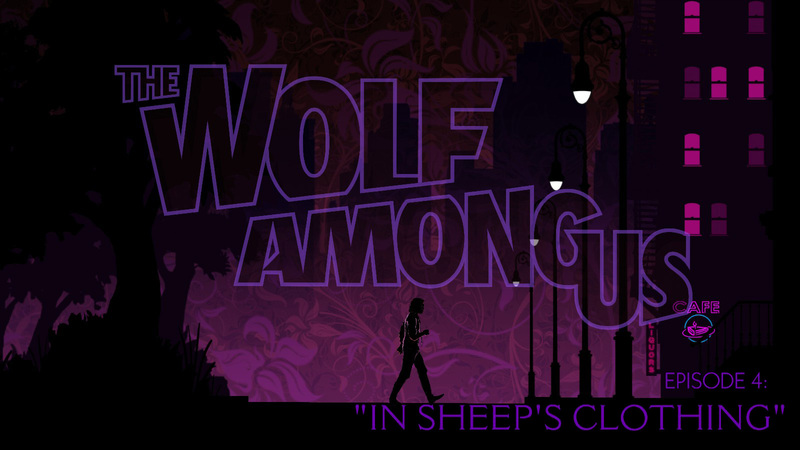 The rest of the episode is no slouch either as we get a few new introductions and get the chance to bury the hatchet with a few others before setting off on what I’m hoping will be as amazing a finale for The Wolf Among Us as we got for the first season of The Walking Dead.